The staff parking lot cannot be used for dropping off or picking up children. All children must stay out of parking lots except when under adult supervision. Never walk between the buses. No double-parking or parking in front of driveways at any time. No parking for drop-off or pick-up on school side of Paso Robles. Always cross at the corner, never in the middle of the street. All children under 17 must wear a bicycle helmet whenever riding a bicycle. Take the time to review safety standards with your child. When bringing children to school, please follow safe driving practices. Your good example is the best teacher possible. 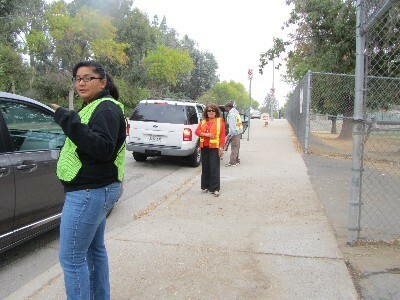 Take time to come north on Paso Robles Ave., and have your child exit the car on the school side of the street. Please do not drop your child off or pick your child up on Labrador Street in front of the school at any time. Only buses are to park there. Meet your child at the gate on Paso Robles in the afternoon. Do not cut in the carpool line. Please cooperate with traffic aides and volunteers. When in line for drop-off and pick-up at the carpool gate on Paso Robles, please keep the intersection of Superior and Paso Robles clear so that the buses have enough space to make a right turn from Superior. Cars in the carpool line should not block the crosswalk on Superior Street. Cars may not cut into the carpool late. No left turns from Balboa to Superior or from Superior to Paso Robles when the carpool lane is full! The carpool gate will close at 8:15 a.m. After the gate is closed, students must enter school through the office. In order to facilitate a smooth traffic pattern on Paso Robles it is suggested that some parents consider picking up students a few minutes later than 2:34 p.m. to avoid the traffic at dismissal. Children who are picked up after school at the carpool gate must be waiting at the gate and not playing on the yard. If you cannot find your child, please drive around the block or park across the street so other parents can move to the front of the line.